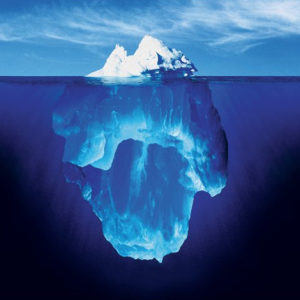 Icebergs give us a great analogy for dental disease. This is because we can only see the top of the tooth on physical examination and the roots remain hidden underneath the gum line. Dental disease is such a huge problem for pets, and we see it affecting the quality of life of pets every single day. Our aim is to change this! Hopefully this blog post will help you to understand dental disease and how we can help you prevent this. My pet seems fine, how can it have dental disease? Gum disease (periodontal disease) is THE MOST COMMON DISEASE in humans, cats and dogs! It is estimated that about 75% of cats and dogs, will have some form of the disease by the time they reach 3-4 years of age. However, dogs and cats will rarely let you know there is a problem. GINGIVITIS (GUM INFLAMMATION) is the first stage in the disease process. It is caused by plaque accumulation on the tooth surface. Plaque is a sticky accumulation of bacteria. The bacteria cause inflammation of the gum which is seen as a red line along the gum just by the tooth. This is potentially reversible at this stage by implementing an effective oral hygiene programme at home. There are many different options, and we can guide you towards the individual most effective option that is suitable for you and your pet. Most pets with gingivitis will give you no indication that there is disease there, except for…. BAD BREATH! Also known as halitosis, bad breath is a warning sign for gum disease. It is not normal for dogs and cats to have smelly breath! If left untreated, gingivitis can progress to… PERIODONTITIS. This stage of the disease is now irreversible. The inflammation has now progressed and becomes more aggressive, destroying the attachment of the tooth, ie the gums may start to receed, the bony socket may start to disappear which makes the tooth become mobile, teeth may eventually fall out. The bacterial infection has become more aggressive, and the bacteria can hide in pockets underneath the gum. This represents a massive infection that the body is continuously trying to fight. These bacteria will enter the bloodstream every time the animal chews, eats and swallows. Most animals can cope with this and destroy the bacteria, but this becomes more difficult the older the patient becomes. Potentially the bacteria can cause infections inside the body, for instance in kidneys, liver and the heart. In many cases it may still be difficult for you to know there is a problem, because your pet may still seem fine. Certainly dogs and cats will still appear to eat happily. This does not mean they are not experiencing pain, rather their instincts for survival mean they must not show any signs of pain. 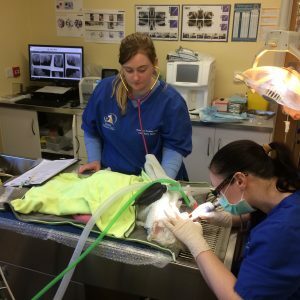 Older animals may seem to be ‘slowing up’ and it is natural to assume this is a normal part of ageing, but we know chronic dental infections like gum disease can make animals more lethargic. Often people will remark once their pet is treated at how much more lively they are. We always perform a thorough oral examination during every visit, and this included checking your pet’s dental health. In the early stages, discussing an oral care programme at home may be all that is needed. In other cases we may recommend treatment under a general anaesthetic. Why does my pet need an anaesthetic for dental treatment? When we examine your pet in the consultation room, we may be able to see some warning signs of dental disease. However, we can only see the tip of the iceberg- we cannot properly assess the health of the tooth roots, or the supporting jaw bone properly in a conscious patient. We also will not be able to see any deep pockets under the gum. Therefore, to perform a thorough oral examination, your pet must remain still for us to assess every surface of every tooth. More importantly, we need to ensure that your pet cannot feel anything during the procedure. Our priority is to make dental treatment for your pet as pain-free as possible. Will anything else be done under the anaesthetic? 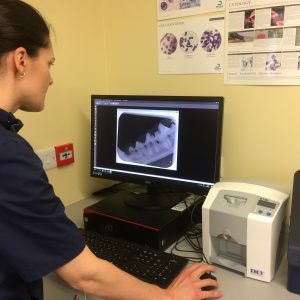 When assessing your pet for dental disease, we include full mouth dental radiography. This allows us to fully assess the health of the tooth including the roots and the bone supporting the tooth. 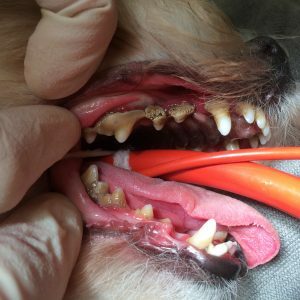 We also chart your pet’s teeth, which include probing and recording depth of pockets around the teeth and health of the gums. We use an ultrasonic scaler to mechanically remove plaque and tartarfrom your pet’s teeth. We also we clean out any pockets under the gum line. Then we polish the teeth, this provides a smooth surface to the tooth to prevent further plaque reaccumulation. It also helps to remove any remaining plaque bacteria. Sometimes teeth are so badly diseased that we need to recommend extractions based upon our findings on dental radiography (x-rays). If this is necessary we use local anaesthetic nerve blocks to reduce discomfort during and after the extractions. When you collect your pet after the treatment, we will fully explain the dental conditions found, and the treatments performed. We will also help you devise a suitable oral care programme to continue with at home. Remember, plaque bacteria will re-attach to the tooth within 24hours! The dental cleaning that we perform will only last a short while, it is the home care that will then help to keep the teeth and mouth healthy.